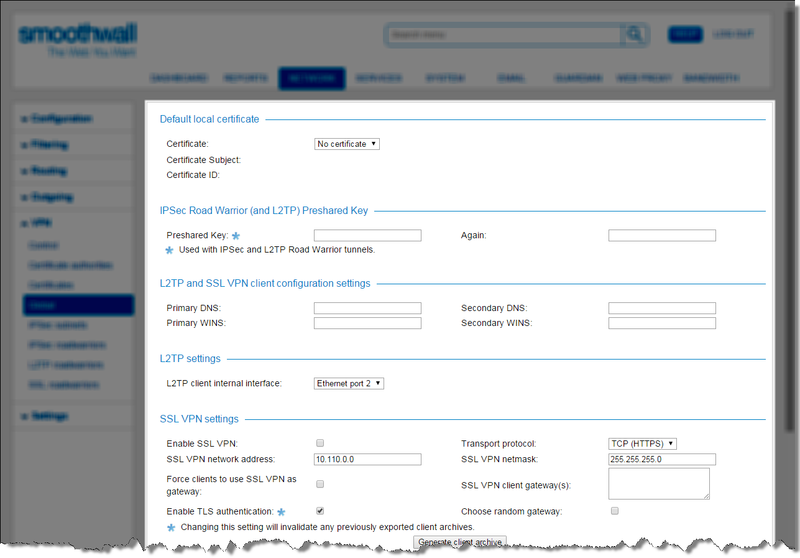 You must set the default local certificate on each Smoothwall host. The default local certificate should be the certificate that identifies its host. 2. In the Default local certificate panel, select the host’s certificate from the Certificate drop-down list. 3. Click Save. This certificate will now be used by default in all future tunnel specifications, unless otherwise specified. 4. When prompted by the Smoothwall, click Restart to deploy the certificate.  Autonomous management of roadwarrior tunnels from multiple sites.  Autonomous management of site-to-site tunnels from multiple sites. Multiple local certificates are typically used to de-centralize VPN management in larger networks. For instance, a VPN could be used to create a WAN (Wide Area Network) between three head offices of an multinational company. Each head office must be responsible for its own VPN links that connect its regional branches to its head office, as otherwise there would be a reliance on a single set of administrators in one country / time zone preparing certificates for the entire organization.  Country head office ID – This ID would be used by a head office to identify itself to head offices from other countries, to form VPN tunnels that make up the international WAN.  Head office ID – This ID would be used by a head office to identify itself to other domestic offices, so that it can manage VPN tunnel connectivity within its own region.  Regional branch office ID – This ID would be used by a branch office to identify itself to the head office and other branch offices that make up the country-wide WAN.  Branch office ID – This ID would be used by a branch office to identify itself to its local roadwarriors, so that it can manage roadwarrior connectivity to its own branch. This example will demonstrate how to delegate VPN management from an unconfigured master Smoothwall to an unconfigured secondary Smoothwall. The secondary Smoothwall is responsible for managing site-to-site and roadwarrior connections within its own geography. Firstly, we must create a tunnel to link the master Smoothwall to the secondary Smoothwall. Since this example covers configuration from scratch, you must follow the instructions from the step most appropriate to your current level of VPN connectivity. 1. On the master system, go to the Network > VPN > Certificate authorities page. 2. Create a local Certificate Authority, see Creating a Certificate Authority . 3. Create signed certificates for the master and secondary Smoothwalls, see Managing Certificates . 4. Install the master signed certificate as the master Smoothwall's default local certificate, see Setting the Default Local Certificate . 5. Create the tunnel specification to the secondary Smoothwall, see Creating an IPsec Tunnel. 6. Export the secondary Smoothwall's signed certificate using the PKCS#12 format, see Exporting Certificates. 7. Export the master Smoothwall's Certificate Authority certificate in PEM format, see Exporting the Certificate Authority Certificate. The remaining series of configuration steps are all carried out on the secondary Smoothwall, firstly to create the primary site-to-site link. 1. On the secondary system, go to the Network > VPN > Certificate authorities page. 2. Import the Certificate Authority certificate on the secondary Smoothwall, see Importing Another Certificate Authority's Certificate. 3. Import the signed certificate on the secondary Smoothwall, see Importing a Certificate. 4. Install the signed certificate as the default local certificate, see Setting the Default Local Certificate . 5. Create the tunnel specification to the master Smoothwall, with Local certificate set to Default see Creating an IPsec Tunnel. 6. Test the VPN connection. The next step is to create an additional Certificate Authority on the secondary Smoothwall. This additional Certificate Authority is used to create another local certificate for the secondary Smoothwall, as well as certificates for any further site-to-site or roadwarrior connections that it is responsible for managing. 2. Create a new local Certificate Authority, see Creating a Certificate Authority . 3. Create a new signed certificate for the secondary Smoothwall (this is used as the secondary Smoothwall's second local certificate, see Managing Certificates . 4. Create a new signed certificate for any host whose VPN connectivity is managed by the secondary Smoothwall. 5. Create a site-to-site or roadwarrior tunnel specification, and choose the second signed certificate (created by the previous step) as the Local certificate. 6. Export the local Certificate Authority and signed certificate created by step 4 to any host whose VPN connectivity is managed by the secondary Smoothwall. 7. Create the remote tunnel specification (this could be a roadwarrior client or another site-to-site gateway). It is possible to authenticate a VPN tunnel by exchanging each host's public key with the other. During authentication, each host uses the other host's public key to decrypt the (private key encrypted) certificate it is passed as identity credentials.  Simplified internal management, using certificates created by an external Certificate Authority.  Tunnelling between two separate organizations using certificates created by different (possibly external) CAs.  Alternative scheme to allow both ends of the tunnel to create their own Certificate Authority and default local certificates. This would enable each VPN gateway to manage their own site-to-site and roadwarrior connections. This achieves the same result as the previous technique described in the Multiple local certificates section. Note: The use of public key authentication should not be considered as a direct replacement for a stringent X509 based authentication setup. While public key authentication does use some of the same technologies that constitute an X509 solution, it lacks the ability to validate certificate authenticity. As such, appropriate precautions should be taken when considering implementing this alternative authentication method. This configuration example uses public key authentication to connect two Smoothwalls, each with their own Certificate Authority so that they can manage their own site-to-site and roadwarrior connections. 1. On both systems, go to the Network > VPN > Certificates page. 2. Export the local certificates from both the Smoothwalls using the PEM format, see Exporting Certificates. 3. Import each PEM certificate on the opposite Smoothwall, see Importing a Certificate. 4. Create an IPSec site-to-site tunnel specification on the first Smoothwall, and select the second Smoothwall’s host certificate in the Authenticate by drop-down list. 5. Create an IPSec site-to-site tunnel specification on the second Smoothwall, and select the first Smoothwall’s host certificate in the Authenticate by drop-down list. The tunnel can now be established and authenticated between the two Smoothwalls. In addition, each Smoothwall is able to autonomously manage its own site-to-site and roadwarrior connections by using its own Certificate Authority to create additional certificates.